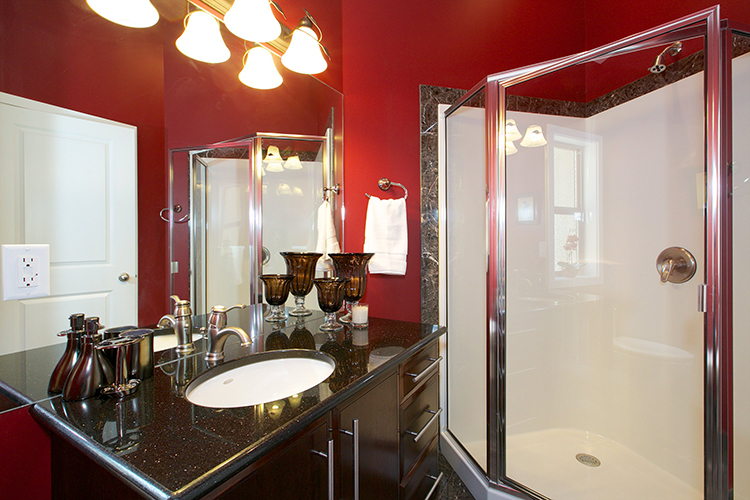 The palette based on red, white and dark grey creates a lively ambience in this colourful bathroom design. The sunlight comes from the wide window opened on the ceiling, while the minimalist dressing table is reduced to a small but cool wooden counter with an originally shaped red washbasin. The bathtub and the box shower are merged in a one single piece of furniture, which optimizes spaces and increases functionality. Inspired by the Japanese art and its linear minimalism, this design masterfully utilizes the contrast between red and brown in order to create a very sophisticated atmosphere in this colourful bathroom. The shower box is behind the wall on which the two washbasins in foreground have been hang together with their two vanity mirrors. 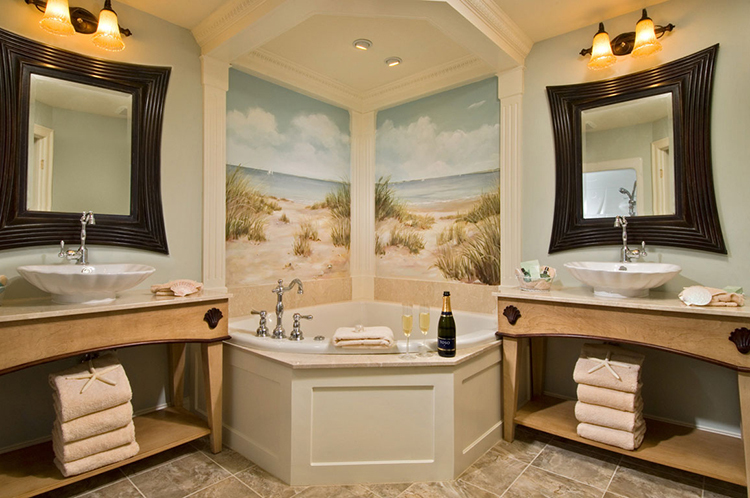 Cool and functional, this bathroom design creates a fine environment where it is nice to spend some time by oneself. The palette based on white, walnut and turquoise creates a relaxing atmosphere, while a dressing table with cabinets, large vanity mirror and drop-in washbasin provides you with a comfortable space where to do your toilette. 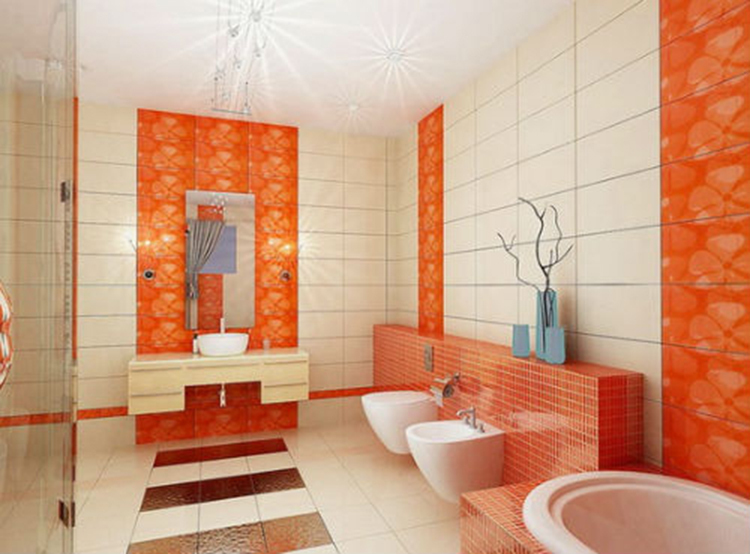 Orange, white and turquoise combine perfectly in this amazing colourful bathroom that is both elegant and comfortable. The sophisticated dressing table with its practical large counter, vertical vanity mirror and the basin leant on its countertop is a great example of good design that skillfully conciliates functionality and beauty. 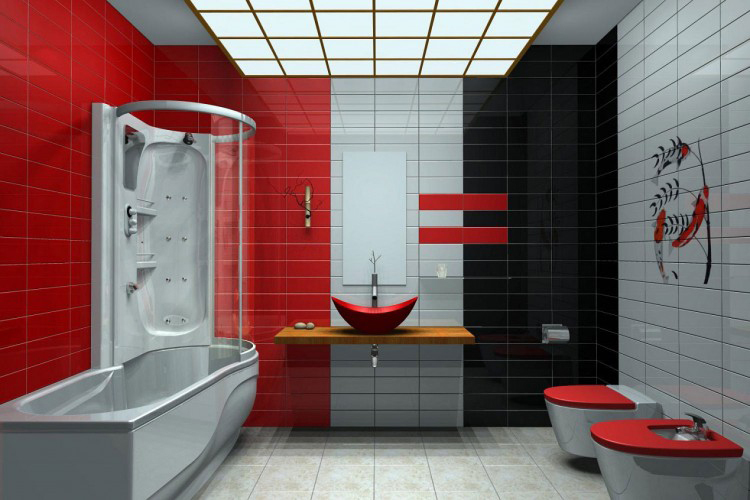 Red, yellow, white and dark brown create a very relaxing ambience in the design of this colourful bathroom that has been expressly thought for small spaces like flats and studios. The bathtub is smartly built in the large opening on the wall on the right, while the cool washbasin in crystal has been placed on the small but nice ethnic style cabinet in the opening near the window. Functionalism triumphs in the design of this tasteful bathroom where the smart combination of blue, white and linear shapes creates a soft and relaxing atmosphere. The long dressing table with huge wall vanity mirror, two drop-in washbasins, stylish fittings and spacious cabinets provides you with all the necessary comforts for doing your daily toilette. 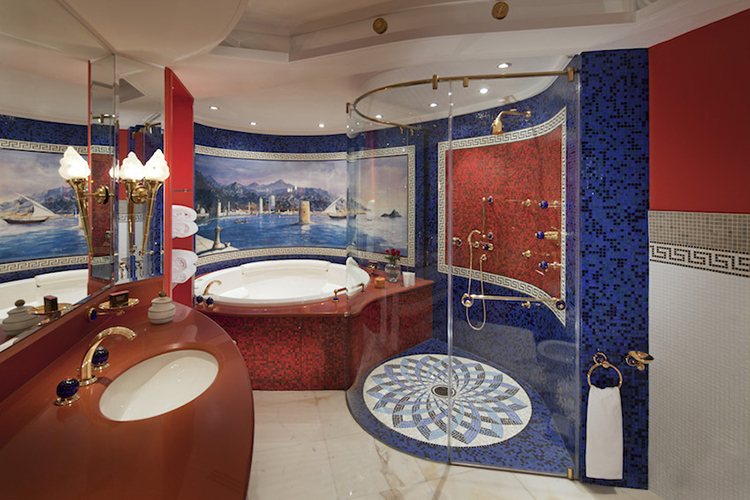 An amazing example of colourful bathroom design where elements taken from classical art (like mosaics and wall decorations) are combined with modern elements (the curvy shapes of the dressing table and the wide Jacuzzi). 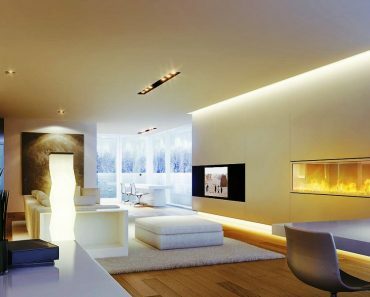 The outcome is a luxurious and warm environment that is yet practical and comfortable. 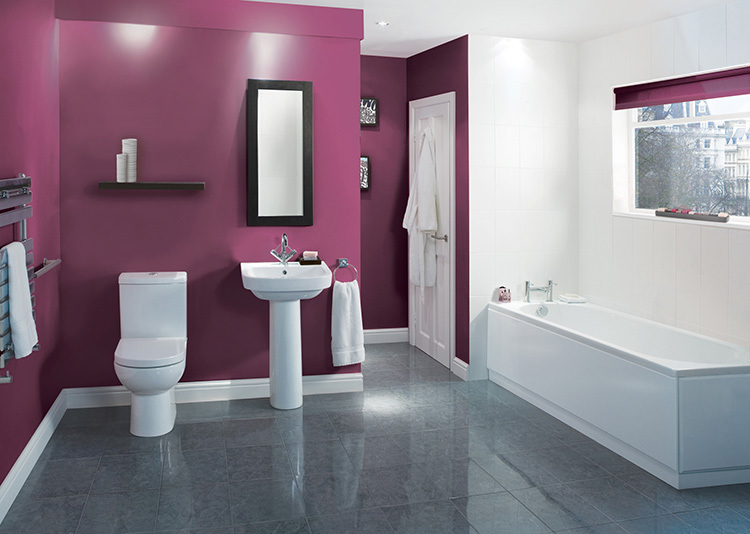 Bright and welcoming, this colourful bathroom design shows how important is the choice of colours. 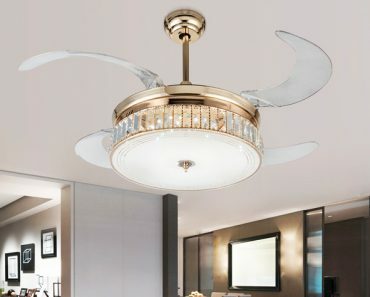 Its palette is based on auburn, a colour that creates a particularly warm atmosphere, combined with cream, white and gold. A touch of distinctive style is added by the elegant fittings, the curvy shape dressing table, the modern bathtub and the nice square shape water closet. 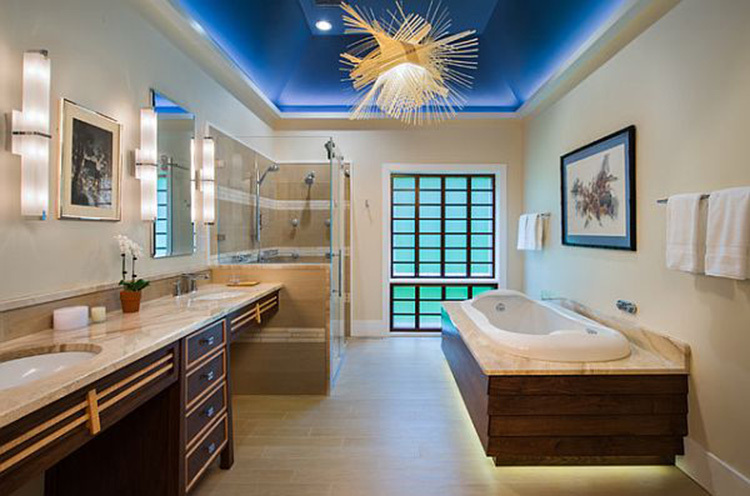 The focal point of this amazing bathroom design is the nice corner where the Jacuzzi has been built in. The false columns and frescos that decorate the wall create an impressive atmosphere of luxury and sophistication. The necessary comfort for your daily toilette is esured by the two dressing tables with washbasins leant on their tops and vanity mirrors on the wall. Both practical and ornamental, the giant wall mirror gives an unusual touch of charm to this colourful bathroom. Its functional design makes the completion of your daily duties fast and comfortable, while space is so much optimized that it has been possible to place in the room even a big wall cabinet with shelves. 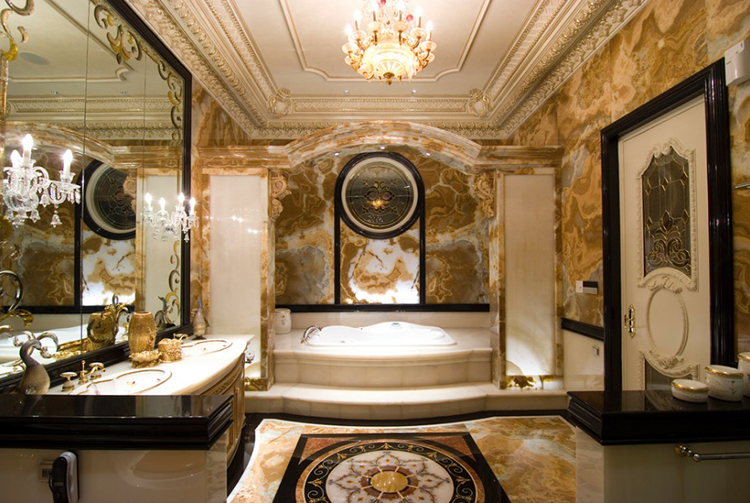 The skilful combination of decorative elements in black marble with wall and floor tiling in yellow vein marbles gives an impression of great elegance in this Colourful bathroom design. The posh dressing table with two drop-in wash-basins, fine taps and a huge vanity mirror with its richly decorated frame is perfect for doing toilette, while the big Jacuzzi built in the bottom of the room provides you with all the comfort you need for unique moments of relaxations and pleasure. 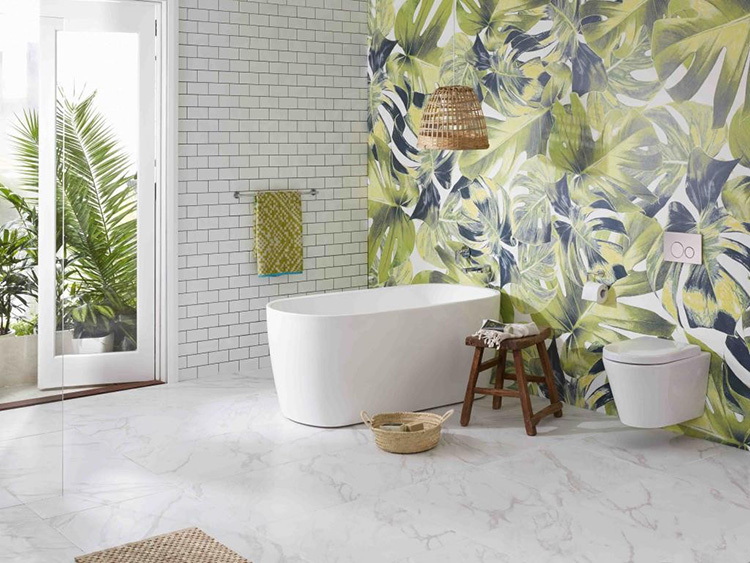 Classical and modern elements are combined in order to create a bright and clean ambience in this colourful bathroom design idea. 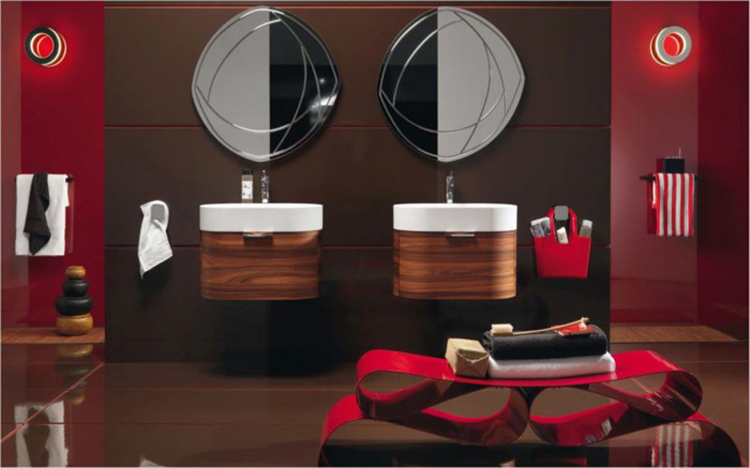 The dressing table has been minimised to a shelf with simple rectangular vanity mirror and circular drop-in washbasin. The bathtub shape reminds the traditional bathtubs of last century, while a practical shower box has been built in the corner on the left. 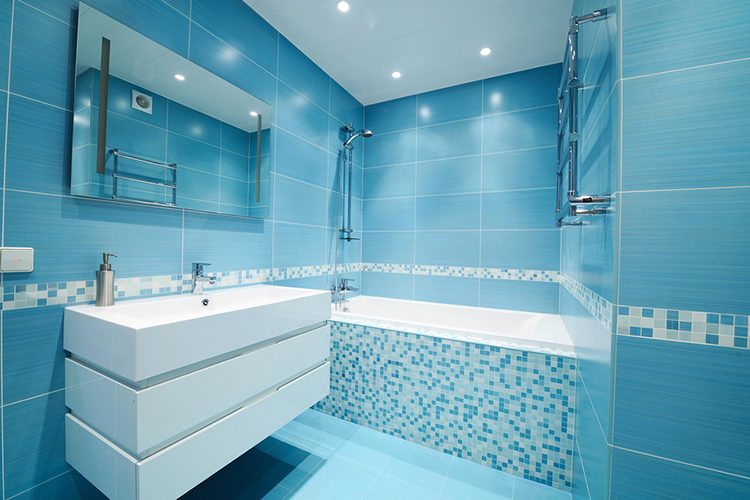 Turquoise is the dominant colour in this bathroom design idea that masterfully optimizes space and is very suitable for a small loft or a studio. The comfortable bathtub is built in the opening near the practical dressing table with big drop-in sink and long vanity mirror. A touch of elegance is added by the decoration made with tiny tiles running along the wall. 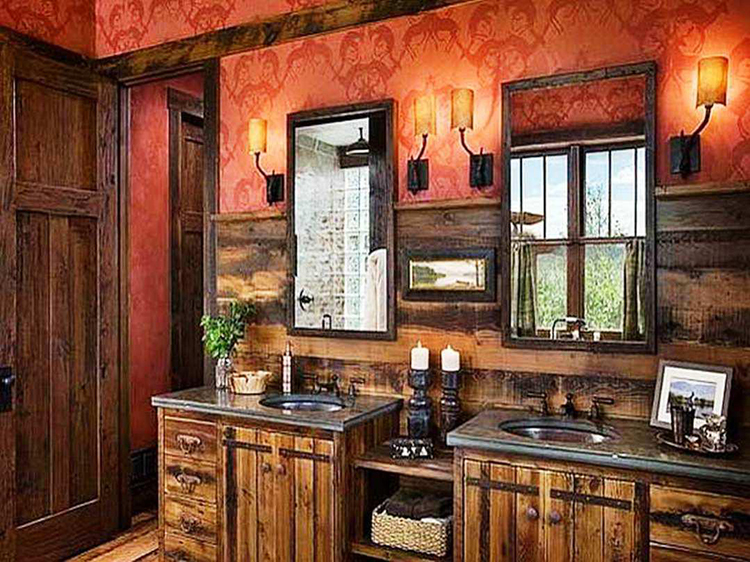 Here the idea is utilizing wooden furniture and wooden wall decorations in order to create an old wild west effect in the design of this traditional and colourful bathroom. Comforts are not sacrificed at all, as the two cabinets with drop-in washbasin provides you with a practical dressing table. The simple shape furniture combines with a palette of white, grey and azure in order to create a bright and clean ambience in this colourful bathroom design idea. 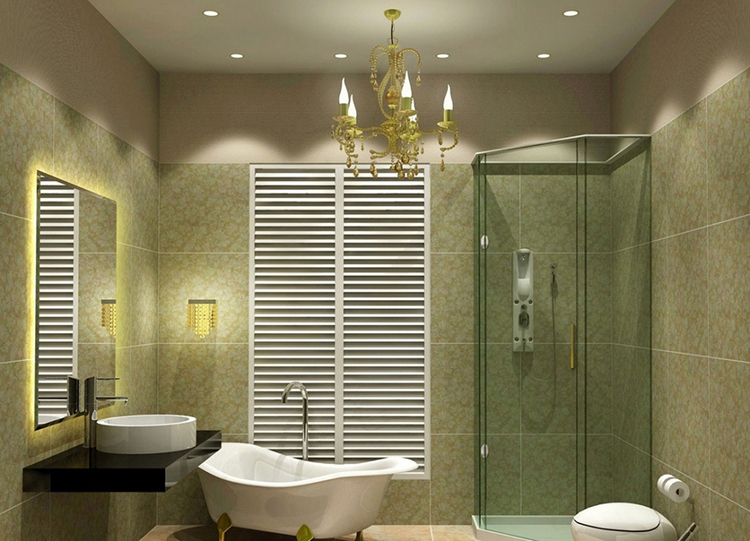 Notice the huge and comfortable shower box made with glass panels and the long and practical dressing table with long rectangular drop-in sink that vaguely reminds the design of industrial kitchens. 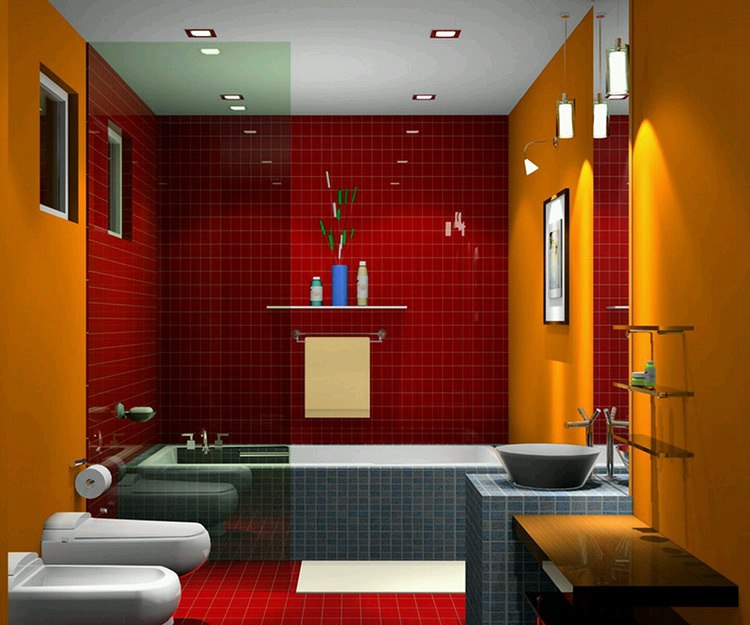 A really colourful bathroom! Its vivid design is based on a palette of red and dark brown. Layout and space optimisation makes it very fitting for small studios and flats. Big shower box, sophisticated fittings, posh dressing table with cabinets and drop-in washbasin and huge wall vanity mirror gives you the best of comfort despite its small size. Tasteful and light, the design of this colourful bathroom creates a cosy and pleasant ambience where it is nice to spend time. Do your toilette in the full comfort of a bathroom equipped with a wide counter with marble top and two washbasins, several cabinets, two wall vanity mirrors, an elegant box shower made with glass panels and, finally, a beautiful, modern bathtub. The utilization of original wall decorations with purple motifs, simple shape furniture and linear elements makes the design of this colourful bathroom smart and sophisticated. A place where it is great to spend some time by oneself, maybe sitting down in meditation on the armchair on the left. The palette of white, slate grey and dark brown combines well with the classical style furniture in order to create a serious yet beautiful ambience in this colourful bathroom design. The layout is very simple and functional. 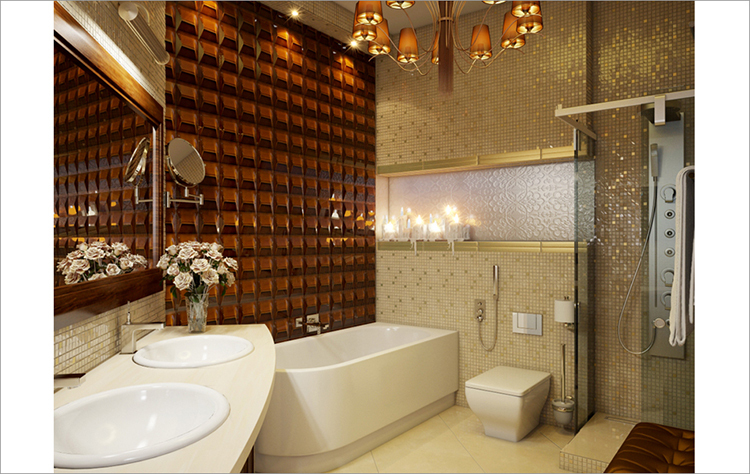 Notice the nice shower box with decorations in tiny shimmering glass tiles and the modern square vanity mirror that add something posh to the whole composition. 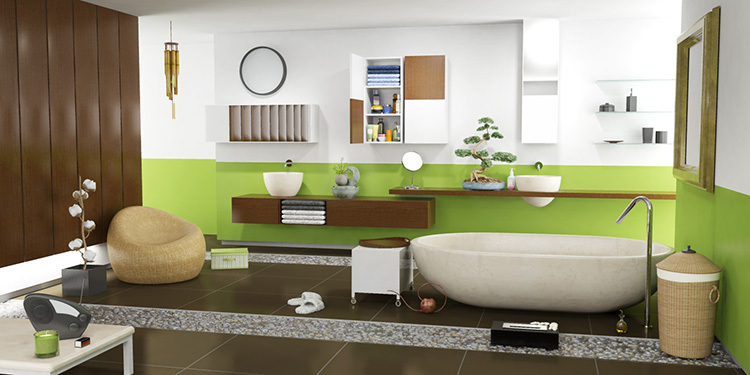 Green, white and brown give a warm vibe to this colourful bathroom design that smartly combines some elements taken from the living room with the ordinary elements of the bathroom. 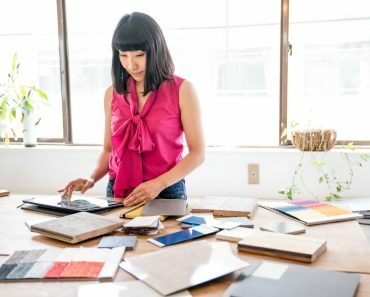 The idea is to create an environment where it is nice not only to do toilette, but also to relax and spend some time by oneself. 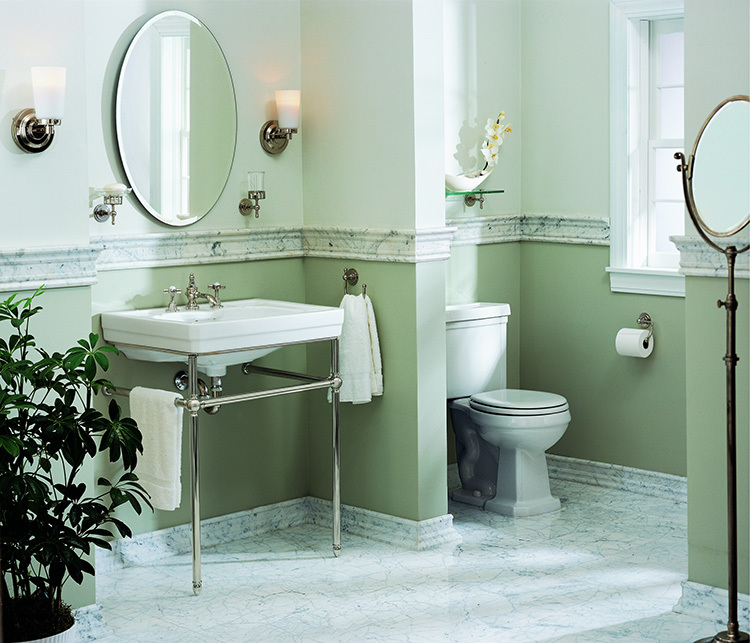 This is a classic example of colourful bathroom design giving a relaxing effect that is based on a palette of light green and white. The furniture, complete with freestanding washbasin, towel rack, oval vanity mirrors, water closet in the typical opening near the window, has a classical but not too elaborated style that is perfect for any loft or studio. The utilization of soft lights and a palette of brown and yellow gives a warm, unusual allure to this colourful bathroom design. The dressing table is well compact and equipped with walnut wooden cabinets, classic wall vanity mirror, one small washbasin and top quality taps. The bathtub is decisively traditional with its lion’s paw shape supports. Notice the unusual but comfortable couch at its side. Traditional elements like the freestanding washbasin, the small square vanity mirror and the practical bathtub are smartly combined with a modern palette of white, grey and bleu in order to create an informal and relaxing ambience in this colourful bathroom design. Notice the cool ornamental vase with flowers near the sink. 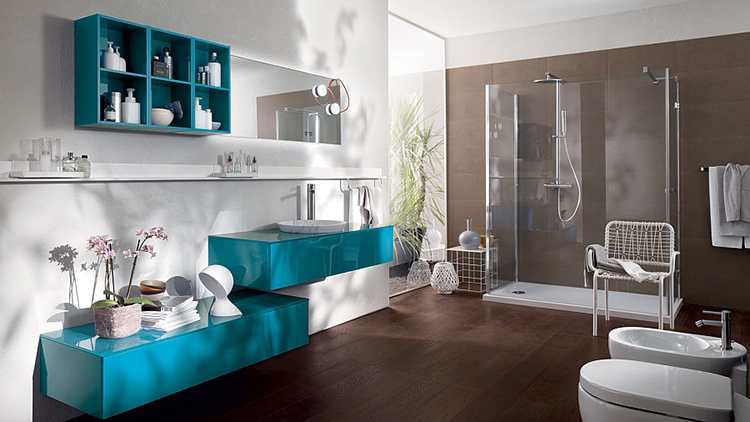 Bright and colourful: this two adjectives describe very well this bathroom design. The wide counter with cabinets, drop-in washbasins, wall vanity mirrors provides you with a great dressing area, while the wash area is fully equipped with a spacious shower box and a comfortable bathtub. 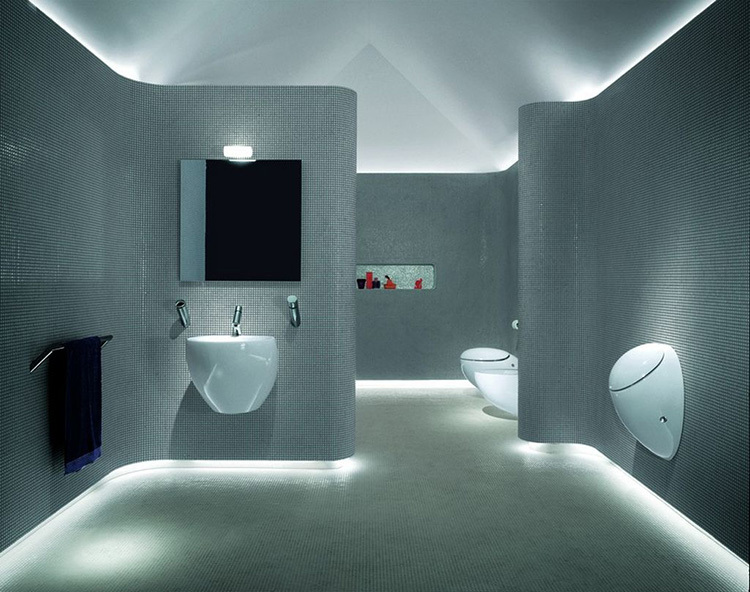 Minimalism triumphs in this posh monochromatic bathroom design. 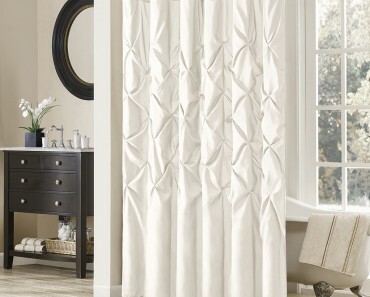 Furniture is very essential, being reduced to toilet, bidet, freestanding washbasin, shower and bathtub. Fittings are modern shaped, the layout extremely functional. Notice the unusual decorative element given by the utilization of a wall cover made with thousands of tiny tiles. 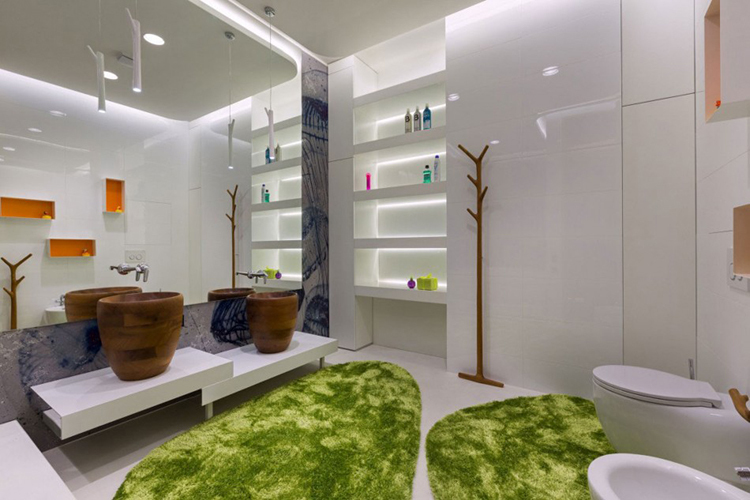 Here comes an example of bright and colourful bathroom where green and white are wisely combined in a design that takes into great account the functionality. 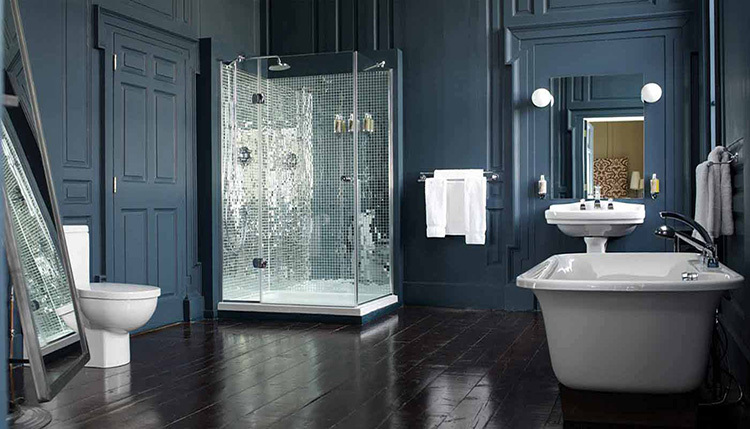 Shapes and lines are minimal and essential, and much room is left by the smart layout of the bathroom. Notice the wall finely decorated with white tiles near the window. A palette of yellow, red and turquoise generates a very warm and bright ambience in this amazing colourful bathroom design. Notice its layout that is very practical and functional. 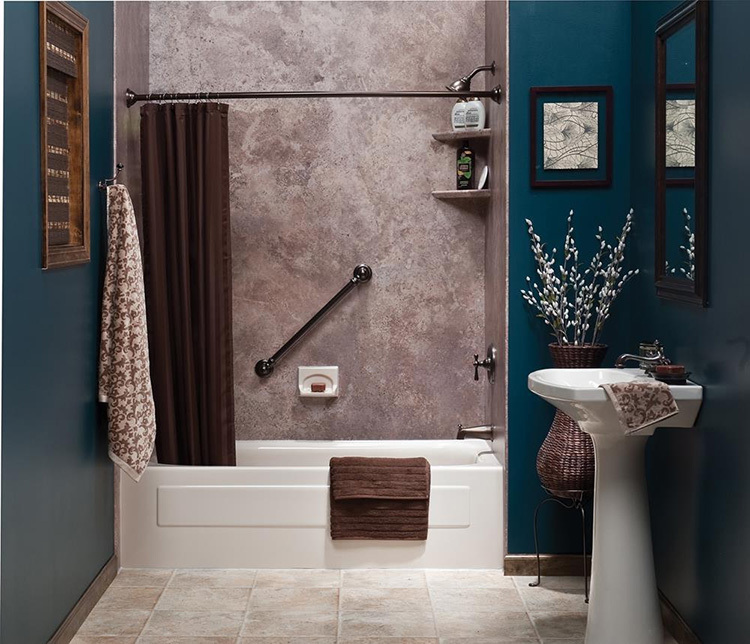 A comfortable bathtub has been built in the bottom of the room. The water closet and the bidet are set in single line on one side, while a practical freestanding washbasin complete of its vanity mirror stands on the opposite side. 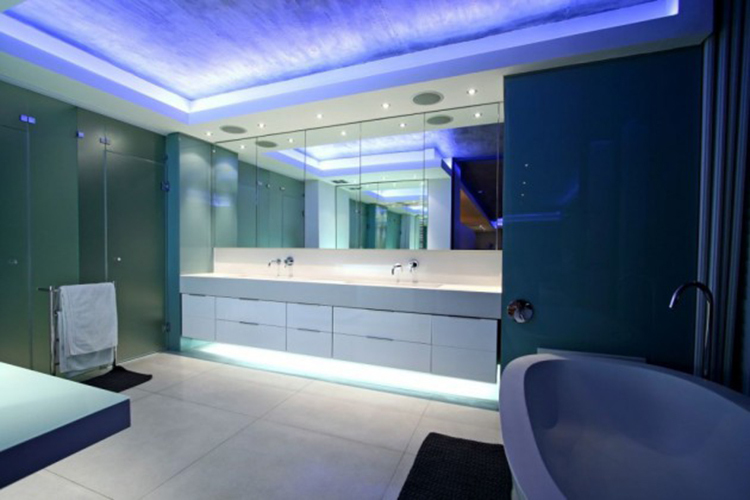 Green, purple and white creates a nice bright effect in this vivid bathroom. 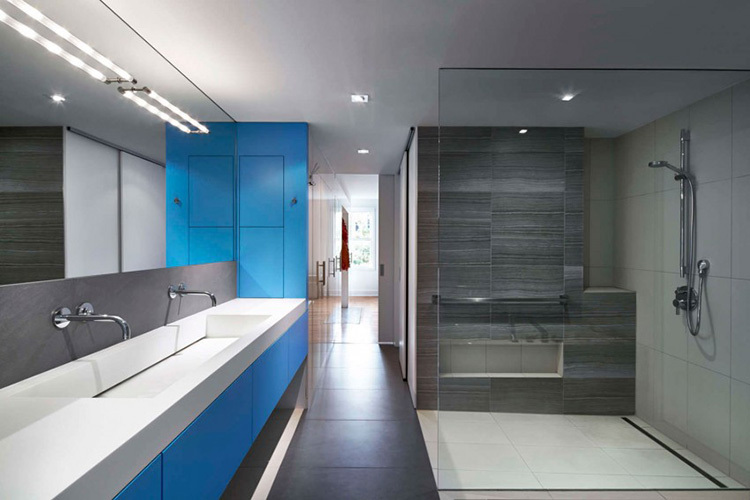 The space is so well optimized that this colourful bathroom looks much wider than actually it is, which makes this design idea a good solution for flats, studios and in general dwellings with limited room. The unusual semi-circular shape of the pillars combined with the alternation of blue and white on the wall creates an informal and relaxing ambience where it is nice to spend time in this colourful bathroom design. Notice the round wall mirror with its nice thick frame and the practical dressing table with spacious drawers and comfortable counter with drop-in washing basin.